Because this is a behavioral economics podcast, it is time to build our behavioral economics foundations. This is the first in a series of episodes where I dig deep into one concept at a time. Previous episodes have been about problems and concepts in business. Such as The Top 5 Wording Mistakes Businesses Make and The Truth About Pricing. Today’s concept is loss aversion. 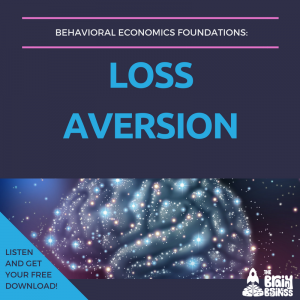 When speaking about behavioral economics loss aversion is usually the first concept I introduce, and it is a great starting point for this podcast. In this episode, I share a cool study of how loss aversion works and then highlight the concept with several examples. These include examples from financial institutions, businesses coaches, interior designers, accountants and more. I also share how these examples can be used in your business. [06:08] Building the foundations of behavioral economics. This series will have a lot of concepts. [06:30] There will also be more problem statement episodes mixed in along with a new exciting format that I’m introducing. [06:50] Loss aversion. The first concept I bring up is always loss aversion. [07:12] This is a very simple concept to grasp and understand. [07:22] This is one of the truest foundations of behavioral economics itself. [07:50] People hate to lose things. [09:10] Our subconscious brain is basically a two-year-old throwing a tantrum. [09:45] In business, we have taken this concept and done things backwards. We try to give people all kinds of things. [10:04] Humans are more easily driven by avoiding a loss than gaining something. [10:52] The difference between how you feel when you find a $20 bill and lose a $20 bill. [13:10] The studies of Kahneman and Tversky have found there is a science to this. We hate losses compared to the joy we feel from getting new things. [13:21] Research shows it takes about DOUBLE the joy felt by a gain to equal the pain felt by a loss. [13:44] Switching from gains to losses. [17:02] Being able to see it is a big key when triggering loss aversion. [17:43] A BUSINESS COACH example. How to use loss aversion to keep your client motivated to do their tasks and reach their goals. [21:30] An ACCOUNTANT example. People are more likely to ask for help if they expect to owe as opposed to ask for help to get more back. [22:23] When messaging around tax time focus on reducing what is owed or being audited and the fear of having to pay or get in trouble. [23:52] An example for FURNITURE sales, interior DESIGN, REAL ESTATE, or any PHYSICAL PRODUCT. Perceived ownership is vital for physical products. [24:34] Getting people to touch the product or walk through a staged home that the buyer could see themselves living in. [25:11] Make the experience as real as possible for the buyer. An example using the show Fixer Upper. [27:18] Loss aversion, the fear of regret and WEDDING dresses. [28:00] How the brain is struggling with the weight of all the decisions it has to make, and knowing once it commits, all the other choices are gone. [28:06] What if questions and fear. [28:22] Triggering loss aversion, so that they know they got a good deal and will feel positive about buying from you. [29:54] An ONLINE SALES example that is the most ridiculous and over the top example of loss aversion that I’ve seen. [33:08] A more subtle approach could be more effective. Getting too extreme could go in the opposite direction. [00:37:15] Next week, we have the very first on air strategy session. There will also be an awesome giveaway. What Is Loss Aversion? Losses attract more attention than comparable gains.